You weed, work, and water, and then one day it happens!! It's finally happened. After weeks of digging, watering, weeding, and a little praying, the work finally pays off with a wonderful overnight gift. This morning, Liberty's Victory Garden took a giant step towards victory. A tiny, green, but beautiful tomato has appeared. Oh Libery I would have woken him up too!! Don't you just love it when you see your garden paying you back for all the attention you give it? Neither wonder you're excited. Keep up the exuberance. You know that gardening is meaning to you what its supposed to when you feel exuberance. Congratulations!!!! Nothing like a BLT with fresh tomatoes!!! or a salad or a fresh marinara sauce or just plain... you name it, it tastes better from the garden. 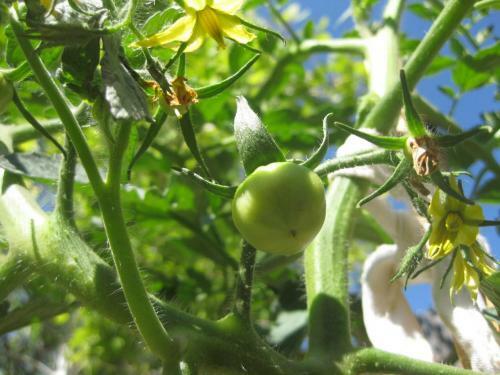 I love your photo of the baby green tomato shot from below, with the sun coming through above. I'd be jumping up and down with joy too. Well done! I love the feeling I get when I come in from the garden with a basket full of home grown veggies.